I decided to give their Scout Folio a test run on my iPad Air 2 and I used the Scout for a solid month. The case material is a composite blend that feels like rubber. The inside of the flap cover is soft, and it has a feel like “felt” which is desirable since this is the part that sits against your iPad screen. Installing your iPad Air 2 is easy enough. There is a lip around the interior that you bend over and it curls around the iPad edge. Once installed, I had zero issues with the iPad remaining in place. Each corner has a re-enforced “bumper” of material and while I never dropped my iPad, I was pretty confident that if I had, this case would give very good protection and absorb the impact. Close the cover of the Scout and your iPad goes to sleep. A magnetic flap keeps the cover closed. 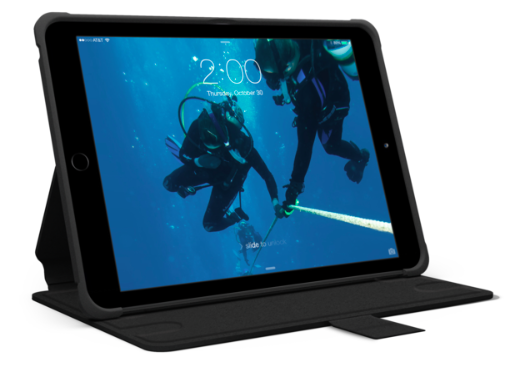 The cover doubles as a screen rest that allows you to set up your iPad for viewing a video or movie. There are indentations (two different angles) in the flap cover where you can “park” your screen. These worked quite well, but since the cover is very thin, you really can’t pick up the case in this position and move it around. Weeks later I installed a screen protector on my iPad and I found the Scout just didn’t like that protector. It kept peeling the protector up at the edges. 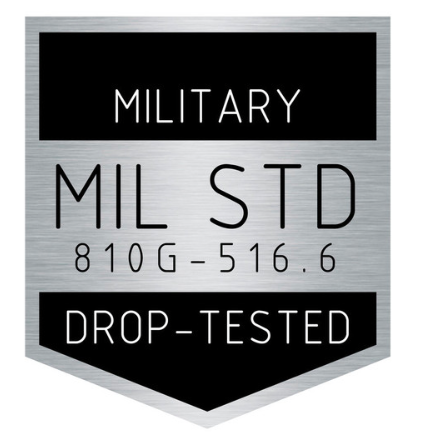 Perhaps another brand that would not go right to the edge would have worked, but I did not have one to test. 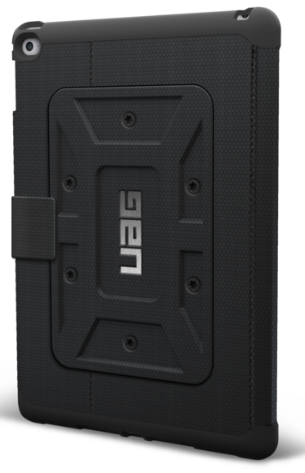 If you plan to use, or like using screen protectors, you may want to contact the UAG folks and ask a few questions first. All of the ports and buttons on your iPad are easily accessible. Nothing is blocked or difficult to get at. The speakers continue to bring un-compromised audio. What I didn’t like was the way the cover connected. The cover is connected to the back at two points, these are like stiff straps coming off the cover. This made the cover feel flimsy, and it has a tendency to flap about once opened. The cover is not rigid; you can bend it since it is made of the same kind of rubbery material as the case, only thinner. 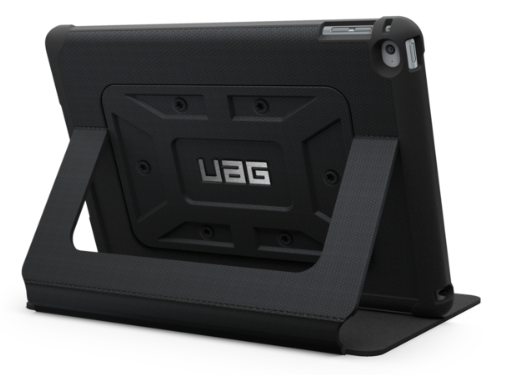 The Urban Armor Scout Folio will absolutely protect your iPad from impact should you drop it. The materials used are water resistant and wash up easily with some soap and water. 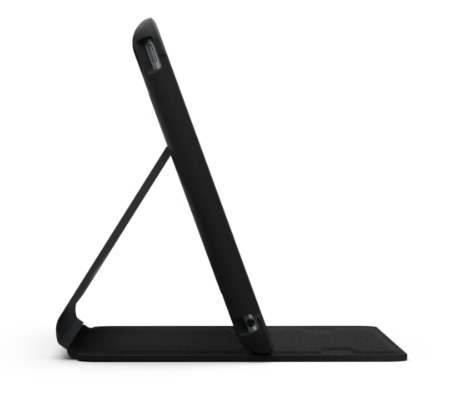 If you are an active iPad user, cleaning up the case after a camping trip or hike will be easy. The viewing angles when using the flap as a rest are actually better than most of the covers I have tried, even though there are really only two angles to choose from. I don’t like the design used to attach the cover which tends to flap about when the case is open. Using a screen protector may be a problem.